A dramatic full-width slider and striking promo boxes to showcase your preferred content will entrance visitors within seconds. Wow them further with Oleander's numerous layouts & post format options, sculpt each post's feel by enabling or disabling the sidebar on post-by-post basis, and make a lasting impact with the robust footer area. Currently selling products or dream of someday opening an online store? Have no fear! Oleander and WooCommerce are the best of friends. 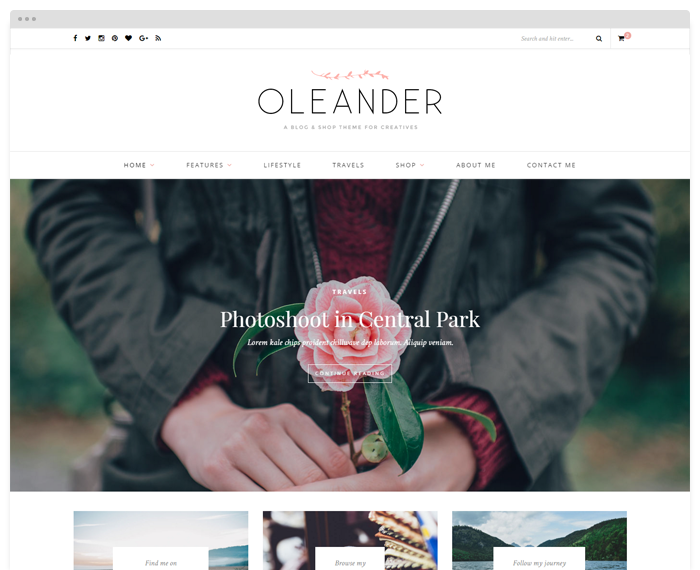 With WooCommerce compatibility and crisp, uncluttered custom styling included, Oleander will ensure your webshop shines as bright as your wares. NEW! Customize Your Theme with Solo Pine Mods Watch Oleander's "Behind the Scenes" video!